Cooking leafy greens, or cooking down dark leafy greens, is something I do almost every day. The “down” refers to down in size, as the greens compact significantly during cooking. 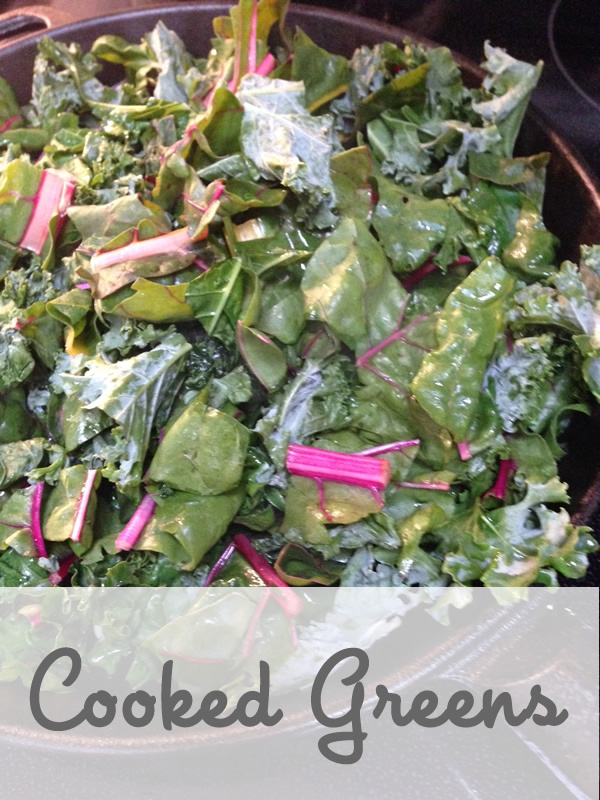 This is such a quick and easy way to eat a large amount of greens with ease. Cooked greens is a corner stone of a healthy diet and delivers valuable nutrients such as magnesium, manganese, potassium, calcium and folate. The dark leafy greens in this recipe are kale and swiss chard, but you can also use collard greens, bok choy, spinach etc. Just remember to start with the sturdier greens like kale, then add “lighter” greens like swiss chard and spinach towards the end to avoid overcooking. As you get used to cooking different leafy greens you will learn how long they need in the pan by paying attention to the texture and flavour you like the best. Have fun with this recipe, let it evolve and use what you have. If you have leftovers, have them at your next meal (including breakfast) cold or warmed up. On my plate cooked greens go with anything! The dark leafy greens in this recipe are kale and swiss chard, but you can also use collard greens, bok choy, spinach etc. Just remember to start with the sturdier greens like kale, then add "lighter" greens like swiss chard and spinach towards the end to avoid over cooking. As you get used to cooking different leafy greens you will learn how long they need in the pan by paying attention to the texture and flavour you like the best. Have fun with this recipe, let it evolve and use what you have! 1-2 tbsp fresh herbs chopped - use what you have like basil, parsley etc. To wash your greens you can rinse them under running water or place them all in a sink filled with cold water. Shake off excess water and place in colander, dish rack or on a tea towel. Mince garlic clove and put aside. One leaf at a time, trim off the end of the stem, then fold leaf in half, top sides together, with a sharp knife cut away middle stem and put aside. Slice the leaf down the middle, then in to strips. Put in a bowl or in a pile on the cutting board, move on to the next leaf until all leaves are done. 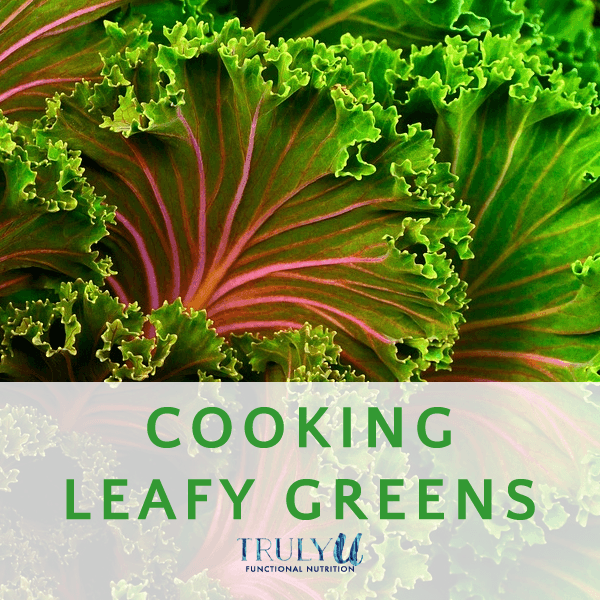 Keep each type of leafy green in separate bowl or piles since cooking time will vary. Heat a 10 - 12" cast iron pan on medium heat and add coconut oil, once melted add the "sturdiest" of the greens, in this recipe that is the kale. Don't worry if it appears to be too much for your pan, as soon as they start to cook down they will reduce in size. Lower the heat and continue to toss the greens to coat with oil. After 2-3 minutes add swiss chard and keep tossing to coat. As the greens cook down the pan may get dry, add 1-2 tbsp of water as needed. When all greens have reduced and are soft, stir in garlic and sprinkle with salt and a few turns of freshly ground pepper. Cook for one more minute then sprinkle with fresh herbs and serve. If you have leftovers, have them at your next meal (including breakfast) cold or warmed up. On my plate cooked greens go with anything. Enjoy! Get more recipes from www.TrulyU.com | Annika Ek Functional Nutritionist | Regain Your Glow. (c) Copyright 2016 - All Rights Reserved Annika Ek International Inc.